Love's Labour's Lost. 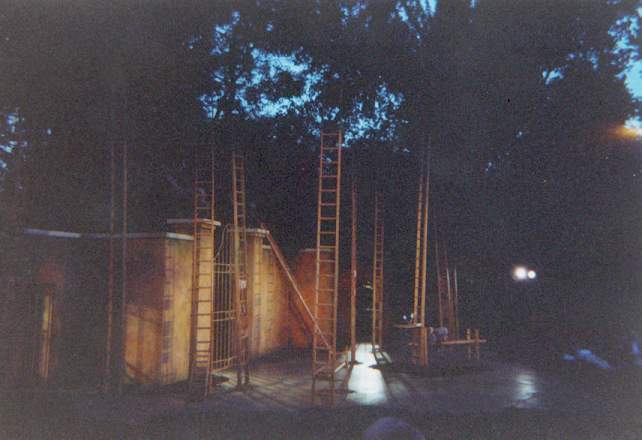 Directed by Rachel Kavanaugh at Regent's Park Open Air Theatre, London, 4 June - 8 September, 2001. Hopkins, Lisa. "Review of Love's Labour's Lost." Early Modern Literary Studies 7.2 (September, 2001): 16.1-2 <URL: http://purl.oclc.org/emls/07-2/hopkrev.htm>. Design by Kit Surrey, music by Terry Davies, lighting by Jason Taylor, sound by Gregory Clarke, and movement by Linda Dobell. With Benedict Cumberbatch as the King of Navarre, Adrian Schiller as Berowne, Gideon Turner as Longueville, Daniel Crowder as Dumaine, Candida Benson as the Princess of France, Rebecca Johnson as Rosaline, Rebecca Callard as Maria, Lottie Mayor as Katherine, Martin Turner as Boyet, David Lucas and Daniel Crossley as French lords, Philip York as Marcade, Christopher Godwin as Don Adriano de Armado, Richard Frame as Moth, Mark Roper as Dull, Paul Kemp as Costard, Alison Crowther as Jaquenetta, John Conroy as Sir Nathaniel, Tim Kightley as Holofernes, and Howard Ellis as a forester. Even more than at the Globe, the real star of the show at the Regent's Park Open Air Theatre is the weather. On a balmy August night, the twinkling lights turned the park into fairyland, setting off to perfection Rachel Kavanaugh's brisk, shapely production of Love's Labour's Lost. In apparent homage to the recent Branagh film version, Kit Surrey's set consists mainly of tall, completely vertical library ladders placed at intervals over the stage. There are books on some of the rungs and the tops of the ladders are painted leaf green or copper beech bronze to blend in with the surrounding foliage. They are used for the king and his lords to hide up and behind during the revelation that all four are in love, but the way that they fade into the trees also means that that most lyrical line of the play, "Still climbing trees in the Hesperides," seems constantly to hang in the air. At the back of the set is a gate flanked by pillars surmounted by life-size stags which swivel round when the setting changes from the court to the field or vice versa. It is an uncluttered setting for an uncluttered production, with understated and functional eighteenth-century costuming, and the efficient cast deliver a pacy version of the play, punctuated with much dashing in and out on both sides of the auditorium and a chase or two round and up the ladders. All the company are strong on clowning skills, and there is a particularly fine Cossack dance from the supposed Muscovites. The speaking of the verse is not quite so distinguished: Benedict Cumberbatch's Navarre is a fine comedian with admirable timing, but only Martin Turner's excellent Boyet and Rebecca Johnson's sparkling Rosaline seem really in full control of the playfulness of their lines. Candida Benson's dumpy, bluestocking Princess of France is a particular weakness, but on the plus side Christopher Godwin's Armado is the most dignified Don I have ever seen, a Quixote in the making, and his brilliantly comic rendition of Hector sets off magnificently the solemn entry of Marcade and the end of the evening, as the lights, one by one, go out.